go Nuts with Krispy Kreme! After the successful team up of America's well-loved doughnut company and every kid's favorite cookie, now comes another exciting creation! 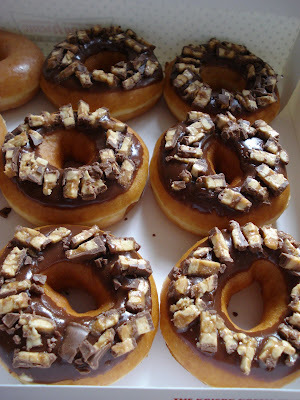 This time, Krispy Kreme presents the Snickers Doughnut! Soft and moist doughnut topped everything that I love in a Snickers bar -- crunchy nuts, sweet chewy caramel, nougat and rich chocolate coating! Snickers has always been my guilty indulgence back in high school. I always grab a bar during finals week to calm my nerves. I'm so happy that Krispy Kreme has made this delicious flavor for Snickers fan all over the country.